During the final months of the Clinton email investigation, FBI agent Peter Strzok was advised of an irregularity in the metadata of Hillary Clinton’s server that suggested a possible breach, but there was no significant follow up, according to two sources with knowledge of the matter. Sources told Fox News that Strzok, who sent anti-Trump text messages that got him removed from the ongoing Special Counsel Robert Mueller’s Russia probe, was told about the metadata anomaly in 2016, but Strzok did not support a formal damage assessment. Fox News is told the Justice Department Inspector General, Michael E. Horowitz, is aware of the allegations. Intelligence beyond top secret was identified on the Clinton server. As secretary of state, Clinton chose to use a private, non-secure server for government business. The FBI had no comment to Fox News’ questions about Strzok, his awareness of the metadata issue, and what actions, if any, he took. There also was no comment from the Inspector General’s office. A report from Horowitz’s 14-month investigation into the DOJ and FBI’s handling of the Clinton email case is expected at any time. 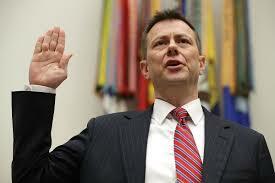 In December, when the texts between Strzok and FBI lawyer Lisa Page became public, congressional sources said Strzok was part of then FBI Director James Comey’s inner circle, who advised and made edits to Comey’s July 2016 public statement recommending against criminal charges in the Clinton probe. Comey said hostile actors got access to private accounts of Clinton’s close contacts. He also said Clinton’s use of personal email was widely known, her email address was readily apparent and she used the account while travelling overseas where hostile nations and sophisticated hackers operate. “Given that combination of factors, we assess it is possible that hostile actors gained access to Secretary Clinton’s personal e-mail account,” Comey said at the time. Another key edit, which appeared to limit Clinton’s legal exposure, included changing the language to describe the former Secretary of State’s actions from “grossly negligent” to “extremely careless.” This is a key legal distinction because, under the federal criminal statute 18 USC 793, the legal standard is gross negligence.